Barry Ferguson’s side were outclassed again. 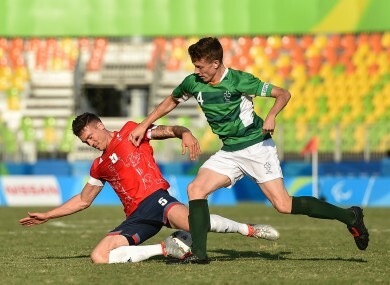 IRELAND’S MISERABLE PARALYMPIC Games group campaign has concluded with a third successive hammering as they were outclassed by Great Britain at Deodoro Stadium tonight. Barry Ferguson’s side will now face United States in a classification match on Thursday to determine who finishes in seventh and eighth place in the 7-a-side competition. After 6-0 and 7-1 drubbings at the hands of Ukraine and Brazil, Ireland were left with nothing more than pride to play for in their final group outing but, once again, they had no answer to far superior opposition. Conor Tuite’s late goal was a mere consolation as Great Britain emphatically recorded their first win of the tournament. “It’s another disappointing result, they’re another quality side but again we showed more of our attacking play than we have been in other games,” Ferguson said. The concession of two goals within the first five minutes meant the writing was on the wall for Ireland, who had goalkeeper Brian McGillivary to thank for a string of impressive saves which limited the damage. Tomi Badun also impressed on his first start and nearly pulled one back but his rasping drive was tipped over the bar. From there, GB took further control with two goals in first-half stoppage time. Ireland, to their credit, responded after the break and scored their second goal of the tournament through Tuite. Email “Great Britain a class apart as Ireland's miserable campaign ends with another heavy defeat”. Feedback on “Great Britain a class apart as Ireland's miserable campaign ends with another heavy defeat”.